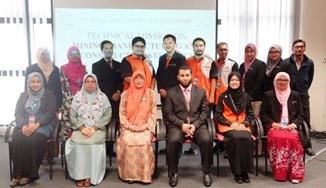 In accordance with its 2017 Annual Work Plan and within the framework of Statistical Capacity Building (StatCaB) Programme, SESRIC organised the Technical Mission on ‘Mining, Manufacturing and Construction Statistics’ at the Department of Statistics (DoS) of Malaysia on 13-15 December 2017. The Training Course was conducted by Mr. Ahmed Fathy Ahmed ABDELHAMID, National Accountant at the Central Agency for Public Mobilization and Statistics (CAPMAS) of Arab Republic of Egypt, with the participation of 16 officials of the DoS. As defined in the Classification of Statistical Activities (CSA Rev. 1 - October 2009; http://goo.gl/olg3Tz); Household surveys includes statistics on specific industrial activities, e.g. steel, shipbuilding, and on construction, trade in specific products related to mining, manufacturing and construction.